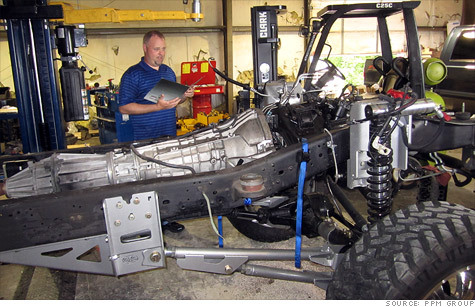 Tennessee-based Performance Machine & Manufacturing revenue is up 80% as business surges, but the machine shop operator is struggling to secure a bank loan to grow the business. NEW YORK (CNNMoney) -- American manufacturers say business is booming again, but many are complaining that banks aren't lending them money to ramp up production. In a new quarterly survey of small to mid-sized manufacturers, 26% of 268 respondents cited "lack of capital to grow" as their biggest challenge at a time when they need loans to hire more workers, buy new equipment and aggressively market themselves. The survey was conducted in April by MFG.com, an online directory that pairs businesses with manufacturers that can produce their goods domestically. Banks, aware of a domestic manufacturing resurgence, say they're willing to lend, according to a range of regional and national financial institutions CNNMoney talked to. But they are proceeding with caution, especially with loans to smaller contract manufacturers or "machine and job shops." Their concern is that these types of businesses are too dependent on short-term contract work. When the economy is good, the work picks up, but projects can also quickly dry up anytime there's a blip, putting banks' loans at risk. Matt Henderson, president of Performance Machine & Manufacturing, operates two machine shops in Tennessee that make parts for the automotive industry. Revenue at his company is up 80% over last year, reaching more than $3 million. As business revs up, Henderson desperately needs about $140,000 in financing to expand and hire workers. But he's struggling to get the loan, despite showing banks that business is booming. His 30-person staff is working six to seven days a week to meet demand. While that's a good sign for the company, it's also forcing him to pay a substantial amount of overtime. "If I get the loan, I can hire three full-time and two part-time workers and buy new equipment," said Henderson. "I also want to do a heavy marketing campaign to bring in more business." His former bank, Bank of America, denied him the loan. His new bank, Regional Finance, offered one, but it'd come with a 6% to 7% interest rate and require a personal guarantee, meaning that Henderson would have to put his own money on the line. Those terms were "unreasonable" to him. Don Vecchiarello, spokesman for Bank of America, didn't address Henderson's situation directly but did say the bank has increased overall lending to small businesses, including manufacturers. "We've also hired more than 800 small business bankers to work with companies and assess their credit needs," he said. "We want to make every good loan we can, because we also make a profit off these loans." Domestic factory work has heated up considerably in the last 12 months as more U.S. companies bring back production from overseas, and others commit to a Made in USA business policy. Consequently, manufacturers overall are adding more workers every month. But "manufacturing is a capital intensive business that requires equipment, tooling and raw material," said MFG.com's CEO Mitch Free. If small factories don't get loans soon, Free said it could stymie the nascent resurgence, and put the brakes on hiring and economic growth. "Any prudent business owner knows that cash is king. When funding is tight, you go into preservation mode, you restrict appetite for expansion and this hurts the economy," said Free. "We all feel it." California-based Superior Aluminum Products, a small manufacturer with 18 workers, makes parts for aerospace companies such as Boeing (BA, Fortune 500) and Lockheed Martin (LMT, Fortune 500). It currently generates $10 million to $12 million a year in sales, and demand is rising. If business keeps at this pace, and the firm can secure a timely $1 million loan, CEO Ian Albert is confident he can boost revenues 40%. "We can increase our sales, buy new equipment and hire 20 more workers," said Albert, who has built and sold five other manufacturing companies in the past. Getting the loan hasn't been easy. Meantime, Albert is still grappling with the fallout from his old bank restructuring: He lost a $3 million line of credit that funded everyday business. He eventually left that bank. He approached Bank of America (BAC, Fortune 500) and Wells Fargo (WFC, Fortune 500), and offered $4.5 million worth of equipment as collateral to borrow against, but they wouldn't give him a credit line. "I finally went to a financing company and got it, but at higher interest rates." Hugh Long, Wells Fargo's head of business banking, didn't respond directly to Albert's situation, but said his bank's focus is to make every loan we can to "credit worthy" customers. "We like making loans to manufacturers. As the economy begins to improve, these are the companies that can create wealth and jobs," he said. Wells Fargo's bankers, Long said, are "aggressively" trying to identify the right manufacturers to make loans to. He added that it doesn't help companies or the bank "if we make loans to customers who can't repay them." Michael McCracken, head of Banco Popular's Chicago region, agreed. "Lending to manufacturers is a hot area right now," said McCracken. "But with smaller manufacturers, we have to consider if this [business] pickup is sustainable." Are you a mom who was inspired to start a small business, and making a million or more in sales now? E-mail Parija Kavilanzand you could be part of an upcoming article. Click here for CNNMoney.com comment policy.